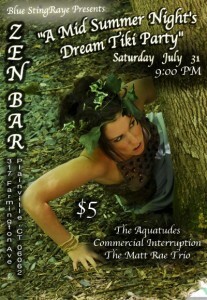 3 bands, tiki drinks and two fistfuls of reverb! There will be 3 local CT bands performing that evening – The Aquatudes (West Hartford), Commercial Interruption (Milford) and headlining will be The Matt Rae Trio (Norwalk). Matt Rae is often referred to as the “Master of the Telecaster” and his 3 solo CD’s have been given favorable reviews by Vintage Guitar and 20th Century Guitar magazines. The doors are at 8:30 and the music kicks off at 9 pm. The Zen Bar has a large dance floor and great atmosphere. This will be THE Best party of the Summer and you don’t want to be left out. All for just $5!